January has been a busy month. We have been putting on the final touches for the Northeast Leaders Conference which will be held March 29 and 30. The schedule and registration forms were sent out in mid-January. Hopefully by the time you read this article you have sent back the registration form and are planning to attend. If you haven’t sent it in yet, there is still time. So please get it in as soon as possible as we’re looking forward to seeing our fellow Grangers. This should be a good conference to learn leadership, membership and fellowship by meeting Grangers from throughout the Northeast. This is the first time it is open to all Grangers throughout the Northeast, not just State Officers, Committee Members and Chairpersons. So please try to attend for good food and fellowship. The Connecticut State Grange is also hosting the Youth Conference which is scheduled for the second weekend in July. Our Youth Director, Dawn Anstett is working on a place to hold this three day event. You’ll be hearing more about this event in upcoming issues of the Granger. 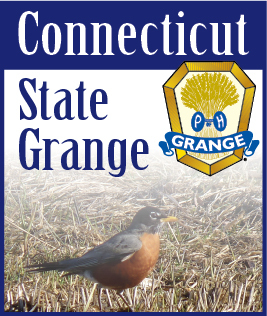 The Connecticut State Grange has a loan program to help Grangers make improvements to their Grange halls. The State Grange has issued two loans to help Granges improve their halls to better serve their members and communities. If you need help to keep your Grange Halls up and running, please contact me. We are here to help. In the middle of January, we lost two Granges. This is the part of my job as Master that is sad. You hate to see a Grange close because you know the chance of them to re-organize will not be possible. Manchester Grange #31 chose to turn in their charter because of the lack of members to hold official meetings. On January 15, I met with five of their members to receive the charter. Southington Grange #25 had their charter revoked for non-payment of dues. The General Deputy and I are working with another Grange where the Master and Secretary have both passed away. They are willing to work with us to get their Grange back on track. In closing, I would like to point out that if your Grange needs help; please let me know and we can see what we can do. President's Message: Fall Is Upon Us! President's Message: We Are Heeereerrr! President's Message: Happy New Year! President's Message: How will you face new challenges? President's Message: Do you need to be right... or right? Will you help lead us? Do you tweet, blog or Facebook?